Italy is the most often visited country by tourists in the world so thus it’s no surprise that there are big international airports in Italy in almost every large city. Let’s get a closer look at Italy airports. The main airport in Rome and Italy is set on the outskirts of its capital city - the Leonardo da Vinci Fiumicino Airport. 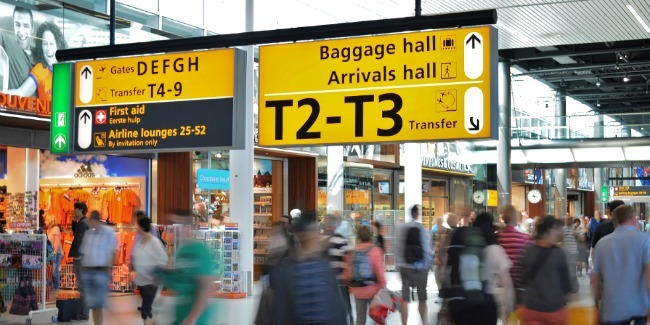 Each year Fiumicino (FCO airport - the Rome airport code) receives about 30 million passengers! It has a seaside location in Fiumicino and is about 30 km (approximately 18 miles) away from Rome. The airport can be reached by public transportation, including buses and trains which can both take you to the Roma Termini rail station in about 40 minutes. And it doesn’t stop at that. Because Rome is such a large city and a major transport hub, there’s also a second popular Rome Italy airport called Ciampino which mostly services low-cost flights. Located northeast of Rome, it is a good alternative to the Rome Fiumicino airport as it is also situated near the city and you can travel to and from it on an express coach bus in a little less than 45 minutes. One of the largest airports in Northern Italy is the Malpensa Airport. This Milan International Airport receives over 18 million people a year and is located 30 km (about 18 mi) away from Milan. The MXP (stands for the Milan airport code) connects with the city in about 30 to 40 minutes via a direct rail link with Milan Cadorna Station as well as offers easy transfers on numerous shuttles. The second of the three Milan Italy airports is the Milan Linate Airport. It is the closest one from the city, only 8 km (5 mi), can take you to the center of town by bus, and services about 10 million passengers per year. The third Milan airport is Bergamo and is a popular choice among travelers coming to Milan from Europe for the possibility of getting relatively cheap flights both to the Italian Alps and Milan itself. Although located further from the city than the previous two airports in Orio al Serio, Bergamo also has well-developed bus connections with the city center. All three airports are suitable for those planning to travel to Lombardy and Liguria regions. What is more, those planning to travel from European countries to northwestern Italy and to the Piedmont region usually arrive in the Turin Airport. Sometimes called Turin-Caselle airport, it is situated 16 km (10 mi) from the city and can be reached from the city and vice versa by a 20-minute rail express or bus. There are two airports near Venice Italy. The main international Venice Italy airport is Marco Polo, this is the airport where most long-haul flights arrive. The VCE airport (Venice Italy airport code) is located nearer to the city about 20 minutes on a regular bus or 1 hour away on a water bus. The second airport is Treviso, it is also located on the mainland and mostly services low-cost flights from Europe, this airport is farther, approximately 45 minutes from Venice on bus. The Florence Italy airport is called Peretola. The FLR airport (Florence Italy airport code) is 6 km (about 4 mi) from Florence, which is 25 minutes on a shuttle to the heart of the city. The second one is the Pisa Airport called Galileo Galilei International Airport. It is actually larger than the airport in Florence and is situated only 3 km (1.8 mi) from the famous Leaning Tower. It is also the best Tuscany airport to arrive to if you wish to explore this Italian region. Those heading to the Emilia-Romagna region of Italy usually come to the international Bologna Airport, carrying the name of Guglielmo Marconi. It is only 15 minutes on a bus to the center of Bologna. One of the popular airports in Southern Italy is the Naples International Airport. Also referred to as Ugo Niutta, this Italy airport is located about 6 km (a little less than 4 miles). The Catania Airport is one of the main airports in Italy’s largest island, Sicily. It is set in the western part of the island close to town, about 10 km (6 miles) from the city. Buses, departing every half an hour, connect the airport with the city and other Sicilian towns. Palermo Airport is located in the northern part of Sicily. It mostly has flights to Italian cities and services not many international routes. Again, bus rides are the optimal way to travel from/to this airport. If the island of Sardinia is on your travel radar, the airport of Italy to arrive to are the ones in Olbia or Cagliari. In the north there are two airports, Olbia international airport is bigger, whereas the Alghero airport services low-cost companies. The southern Sardinia international airport is in Cagliari.